After losing the initiative in the western regions of Syria, the Daesh leadership decided to focus its efforts on capturing the city of Deir ez-Zor that has already been besieged by terrorists for quite some time, Rudskoy explained. "From January 22 to January 24, the aircraft from the air group deployed in Syria caried out 169 combat sorties hitting a total of 484 terrorist targets," Lt. Gen. Sergey Rudskoy, chief of the Main Operational Directorate of the General Staff of the Russian Armed Forces, told reporters. "In order to provide support to the full-scale offensive of the Syrian Arab Army and patriotic opposition forces, on January 22 the Russian Aerospace Forces began commencing massed airstrikes against terrorist assets in Syria. About 70-100 sorties are being conducted every day," he said. Russian Tu-22M3 Backfire strategic bombers carried out 18 combat sorties against terrorist targets in the last three days, the Russian General Staff said Monday. "Russian Tu-22M3 long-range bombers carried out 18 sorties against Daesh forces deployed in the vicinity of Deir ez-Zor from January 22 until January 24," Rudskoy said. 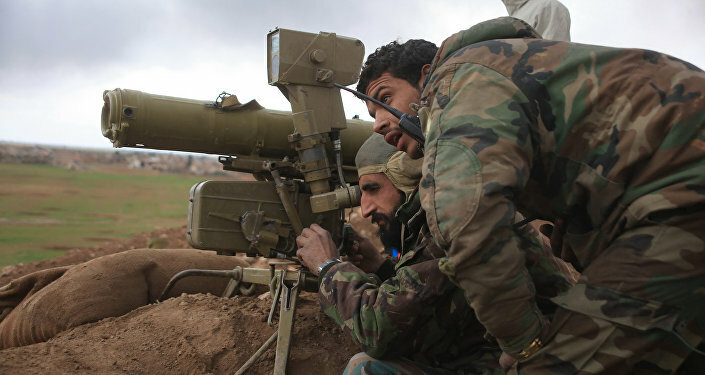 Dozens of Daesh terrorists were killed and many more wounded after the Syrian army and the National Defense Forces (NDF) foiled a spate of militants' attempts to seize hilltops overlooking a riverside area of the strategic town of Baqaliyeh, located in the eastern province of Deir ez-Zor.